The Hooded Vest is a sleeveless vest with an attached hood, typically worn under a One Piece Fullsuit for cold conditions. 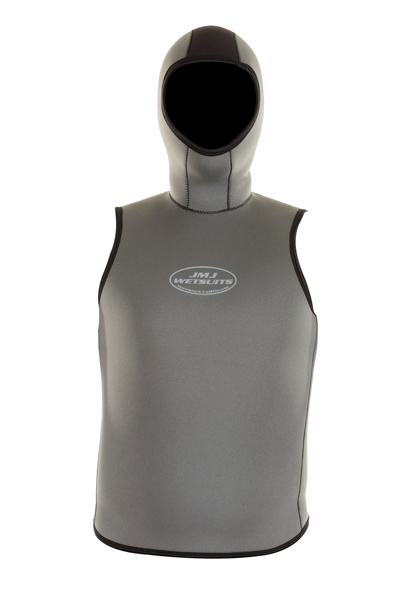 The attached hood provides insulation for the head and prevents water from flushing down the back of the neck, while the vest provides a layer of insulation for the torso. 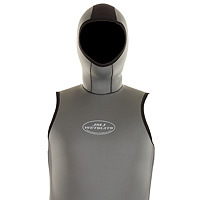 This vest comes with an optional Neoskin “skin-in” face seal to form an almost water-tight seal around the face, preventing water from entering the hood. Our dive vests are made with durable dive-grade neoprene that has better “memory” than other types of neoprene, meaning it will resume its thickness, even after being compressed many times at dive depths. All seams are glued & blind stitched for durability and have Lycra bindings for flexibility. They are available in various thicknesses with your choice of interior Nylon lining or Neoskin. Our vests are made to last for many dives to come.